Preface. Since this article was published in 2013, 13 of the 37 at risk plants Cooper listed have been or are scheduled to close: (closing date): Davis-Besse (5/31/2020), Diablo Canyon 1 (11/2/2024) & Diablo Canyon 2 (8/26/2025), Clinton, Ft. Calhoun (10/24/2016), Indian Point 3 (4/30/2021), Oyster Creek (9/17/2018), Palisades (2022), Perry (5/31/2021), Pilgrim (6/1/2019), Quad Cities (6/1/2018), Three Mile Island (September 2019), Vermont Yankee (12/29/2014). Nuclear power plants need more water than coal or natural gas plants to cool down, 720 gallons per megawat-hour (coal needs 500 gallons and natural gas 190 gallons of water). So climate change may shut down additional plants due to drought as lake and stream levels drop or get too hot to cool the plant, and new nuclear power plants may not get approved in the future with that in mind (Kaufman 2018). Not long before this article was written, Kewaunee (05/07/2013) and Crystal River (02/20/2013) closed for financial reasons. FitzPatrick & Ginna (NY) were to have closed 1/27/2017 but Governor Cuomo passed a ratepayer tax of $7.6 billion to extend operations until 2029. Another plant that was under construction, Savannah River Site nuclear weapons complex near Aiken, is being shut down after going billions over budget. The project, known as MOX, was touted as a way to get rid of excess U.S. weapons-grade plutonium and provide jobs as part of an arms-control agreement with Russia. But it recently was projected to cost at least $17 billion to complete, about three times original projections (Fretwell 2018). There are only 61 commercially operating nuclear power plants left (of 90) in the United States today. Cooper , Mark. July 18, 2013. Renaissance in reverse: competition pushes aging U.S. nuclear reactors to the brink of economic abandonment. Institute for Energy and the environment, Vermont Law School. 47 pages. Although Wall Street analysts expressed concerns about the economic viability of the aging nuclear fleet in the U.S., the recent early retirements of 4 nuclear reactors has sent a shock wave through the industry. One purely economic retirement (Kewaunee, 1 reactor) and three based on the excessive cost of repairs (Crystal River, 1 reactor, and San Onofre, 2 reactors). In addition to the cancellation of 5 large uprates (Prairie Island, 1 reactor, LaSalle, 2 reactors, and Limerick, 2 rectors), four by the nation’s large nuclear utility, suggest a broad range of operational and economic problems. These early retirements and decisions to forego uprates magnify the importance of the fact that the “nuclear renaissance” has failed to produce a new fleet of reactors in the U.S.
With little chance that the cost of new reactors will become competitive with low carbon alternatives in the time frame relevant for old reactor retirement decisions, a great deal of attention will shift to the economics of keeping old reactors online, increasing their capacity and/or extending their lives. The purpose of the paper is not to predict which reactors will be the next to retire, but explain why we should expect more early retirements. It does so by offering a systematic framework for evaluating the factors that place reactors at risk of early retirement. It extracts 11 risk factors from the Wall Street analysis and identifies three dozen reactors that exhibit four or more of the risk factors (see Exhibit ES-1). It shows that the poor performance of nuclear reactors that is resulting in early retirements today has existed throughout the history of the commercial nuclear sector in the U.S. The problems are endemic to the technology and the sector. It demonstrates that the key underlying economic factors — rising costs of an aging fleet and the availability of lower cost alternatives – are likely to persist over the next couple of decades, the relevant time frame for making decisions about the fate of aging reactors. While the purpose of the Wall Street analyses is to advise and caution investors about utilities that own the aging fleet of at-risk reactors, my purpose is to inform policymakers about and prepare them for the likelihood of early retirements. ECONOMIC: Cost , Small, Old, Standalone, Merchant, 20 yr<w/out extension , 25yr< w/ext. Sources and Notes: Credit Suisse, Nuclear… The Middle Age Dilemma?, Facing Declining Performance, Higher Costs, Inevitable Mortality, February 19, 2013; UBS Investment Research, In Search of Washington’s Latest Realities (DC Field Trip Takeaways), February 20, 2013; Platts, January 9, 2013, “Some Merchant Nuclear Reactors Could Face Early Retirement: UBS,” reporting on a UBS report for shareholders; Moody’s, Low Gas Prices and Weak Demand are Masking US Nuclear Plant Reliability Issues, Special Comment, November 8, 2012.; David Lochbaum, Walking a Nuclear Tightrope: Unlearned Lessons of Year-Plus Reactor Outages, September 2006, “The NRC and Nuclear Power Plant Safety in 2011, 2012, and UCS Tracker); NRC Reactor pages. 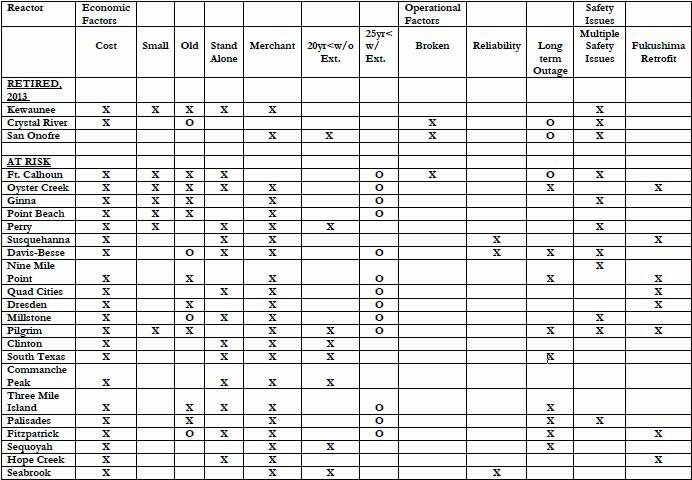 Operational Factors: Broken/reliability (Moody’s for broken and reliability); Long Term Outages (Lochbaum, supplemented by Moody’s, o-current, x=past); Near Miss (Lochbaum 2012); Fukushima Retrofit (UBS, Field Trip, 2013) . Economic Factors: Cost, Wholesale markets (Credit Suisse) Age (Moody’s and NRC reactor pages with oldest unit X=as old or older than Kewaunee, i.e. 1974 or earlier commissioning, O= Commissioned 1975-1979, i.e. other pre-TMI); Small (Moody’s and NRC Reactor pages, less than 700 MW at commissioning); Stand Alone (Moody’s and NRC Reactor pages); Short License (Credit Suisse and NRC Reactor pages). Some of the characteristics are site specific, some are reactor specific. The reactors at a specific plant can differ by age, size, technology and the current safety issues they face. Historically, in some cases there were long outages at one, but not all of the reactors at a plant. Similarly, there are numerous examples of a single reactor being retired early at a multi-reactor site. Given the complexity of an analysis of individual reactors across the eleven risk factors and the fact that unique precipitating events are the primary cause of early retirements, I count only one potential reactor retirement per plant. If anything goes wrong, any of these reactors could be retired early. The precipitating event could be a further deterioration of the economics, or it could be mechanical or safety related problems, as indicated on the right side of the table. The market will operate faster in the case of merchant reactors, but economic pressures have become so severe that regulators have been forced to take action as well. The same factors call into question the economic value of license extensions and reactor uprates where they require significant capital outlays. Palisades (Repair impending, local opposition), Ft. Calhoun (Outage, poor performance), Nine Mile Point (Site size saves it, existing contract), Fitzpatrick (High cost), Ginna (Single unit with negative margin, existing contract), Oyster Creek (Already set to retire early), Vt. Yankee (Tax and local opposition), Millstone (Tax reasons), Clinton (Selling into tough market), Indian Point (License extension, local opposition), A couple of other reactors that are afflicted by a large number of these (Davis-Besse, Pilgrim) could also be particularly vulnerable. The lesson for policy makers in the economics of old reactors is clear and it reinforces the lesson of the past decade in the economics of building new reactors. Nuclear reactors are simply not competitive. They are not competitive at the beginning of their life cycle, when the build/cancel decision is made, and they are not competitive at the end of their life cycles, when the repair/retire decision is made. They are not competitive because the U.S. has the technical ability and a rich, diverse resource base to meet the need for electricity with lower cost, less risky alternatives. Policy efforts to resist fundamental economics of nuclear reactors will be costly, ineffective and counterproductive. Over the last decade, as nuclear advocates touted a “nuclear renaissance” they made extremely optimistic claims about nuclear reactor costs to convince policymakers and regulators that new nuclear reactors would be cost competitive with other options for meeting the need for electricity. These economic analyses rested on two broad categories of claims about nuclear reactors. (1) New nuclear reactors could be built quickly and at relatively low cost. (2) New Nuclear reactors would run at very high levels of capacity for long periods of time with very low operating costs. Dramatically escalating construction cost estimates and severe construction difficulties and delays in virtually all market economies where construction of a handful of new nuclear reactors was undertaken have proven the first set of assumptions wrong. Recent decisions to retire aging reactors early remind us that the second set of assumptions was never true of the first cohort of commercial nuclear reactors and call into question the extremely optimistic assumptions about the operation of future nuclear reactors. However, the problem is more profound than that. It is not only old, broken reactors that are at risk of retirement. As old reactors become more expensive to operate, they may become uneconomic to keep online in the current market conditions. Indeed, the first reactor retired in 2013 (Kewaunee) was online and had just had it licenses extended for 20 years, but its owners concluded it could not compete and would yield losses in the electricity market of the next two decades so they chose to decommission it. Things have gotten so bad in the aging nuclear fleet in the U.S. that Wall Street analyst have begun to issue reports with titles like “Nuclear… the Middle Age Dilemma? Facing Declining Performance, Higher Costs and Inevitable Mortality,” “Some Merchant Nuclear Reactors Could Face Early Retirement: UBS” and “Low Gas Prices and Weak Demand are Masking US Nuclear Plant Reliability Issues. These early retirements magnify the importance of the fact that the “nuclear renaissance” has failed to produce a new fleet of reactors in the U.S. With little chance that the cost of new reactors will become competitive with low carbon alternatives in the time frame relevant for old reactor retirement decisions, a great deal of attention will shift to the economics of keeping old reactors online, increasing their capacity and /or extending their lives. As has been the case throughout the history of the commercial nuclear sector in the U.S., the primary obstacle to nuclear power is economic and it is critically important to cut through the hype and hyperbole on both sides of the nuclear debate to reach sound economic conclusions. In half of the U.S. the price of electricity is set in a wholesale market. In these areas, the wholesale prices, which is what all generators earn, are driven primarily by the fuel cost of running the last plant that needs to be operated to make sure supply is adequate to meet demand. This is the price that “clears” the market. In most regions of the nation, the price is set by natural gas, with coal playing that role in some places. In those areas of the U.S. were the wholesale price of electricity is set by the market, prices have been declining dramatically. Over the past half-decade, the market clearing price has been declining. Fuel costs have been declining, driven by a dramatic decline in natural gas prices. At the same time, demand for electricity has been declining due to increasing efficiency of electricity consuming equipment and consumer durables. Moreover, the increase in renewable generation, which has the lowest (zero) cost of fuel and therefore always runs when it is available, has lowered the demand for fossil fired generation. This means that the market clears with more efficient (lower cost) plants, which lowers the market clearing price even farther. For consumers this is a very beneficial process; for producers not so much, since the prices they receive are declining. Old nuclear reactors are particularly hard hit by this market development. With prices set by fuel costs, all of the other costs of nuclear generation must be paid for out of the difference between the fuel costs of the reactor and the market clearing price. This is called the “quark” spread. A nuclear reactor is paid the market clearing price, which it must use to pay its own fuel costs, while the remainder must cover its other costs. While nuclear fuel costs are low (although they have been rising), their non-fuel operation and maintenance costs and their ongoing capital costs are high. The high nonfuel operation and maintenance costs (including capital additions) are high because of the complex technology needed to control a very volatile fuel. As reactors age, these non -fuel operating and ongoing capital additions rise. With “quark” spreads falling, and operating costs rising, the funds available may no longer cover the other costs, or yield a rate of profit that satisfies the reactor owner. Old reactors are pushed to the edge. If a reactor is particularly inefficient (has high operating costs), needs major repairs, or a safety retrofit is required, the old reactors can be easily pushed over the edge. The problem for old nuclear reactors has become acute. At precisely the moment that quark spreads are declining, the non-fuel operating costs of old reactors are rising. “Following Dominion’s recent announcement to retire its Kewaunee nuclear plant in Wisconsin in October, we believe the plant may be the figurative canary in the coal mine. Despite substantially lower fuel costs than coal plants, fixed costs are approximately 4-5x times higher than coal plants of comparable size and may be higher for single-unit plants. Additionally, maintenance capex of ~$50/kW-yr, coupled with rising nuclear fuel capex, further impede their economic viability … We believe 2013 will be another challenging year for merchant nuclear operators, as NRC requirements for Fukushima-related investments become clearer in the face of substantially reduced gas prices. While the true variable cost of dispatching a nuclear plant remains exceptionally low (and as such will continue to dispatch at most hours of the day no matter what the gas price), the underlying issue is that margins garnered during dispatch are no longer able to sustain the exceptionally high fixed cost structures of operating these units. Nuclear units… have continued to see rising fuel and cost structures of late, with no anticipation for this to abate. Moreover, public policy initiatives, such as Fukushima-related retrofits and mandates to reduce once- through cooling (potentially requiring cooling towers/screens for some units) and new taxes on others (Vermont Yankee, Dominion’s Millstone) have further impeded the economics of nuclear. The problem is not a figment of the imagination of Wall Street analysts or confined to a small number of individual reactors. It is widespread, as demonstrated by the behavior of Exelon, the largest nuclear utility in the U.S. with ownership of one-quarter of all U.S. reactors. Exelon was also a big supporter of wind power, until the economics of old nuclear reactors began to deteriorate. Exelon then launched a campaign against subsidies for wind power, because the rich wind resource in the Midwest had begun to back out expensive gas. Market clearing prices declined reducing the margins that its nuclear fleet enjoyed. Exelon’s campaign against wind was sufficiently vigorous to get it kicked off the board of the American Wind Energy Association. After decades of arguing that nuclear is the ideal low (fuel) cost, always-on source of power and touting the benefits of free markets in electricity, Exelon is proposing to reduce its output of nuclear power to drive up the market clearing price. Since withholding supply for the purpose of increasing prices is frowned upon (indeed would be a violation of the antitrust laws if they applied), it has to negotiate with the Independent System Operator to reduce output. These acts of desperation clearly suggest that the economics of old reactors are very dicey. The pressure is magnified because the cost of operating old reactors is rising. Credit Suisse estimates that in the period when “quark” spreads were falling from $40/MWH to $20-$30/MWH, the operating costs of nuclear reactors were rising to the range of $25-$30/MWH. The resulting margins are razor thin, if not negative. The primary drivers of cost increases are non-fuel O&M and fuel costs, which have increased about $10/MWH. Thus declining wholesale prices account for about two-thirds of the shrinking margin and rising costs account for one-third. The Credit Suisse analysis did not stop with operating costs, but went on to identify another important characteristic that affects aging nuclear reactors, outages. A nuclear reactor only receives the wholesale prices and earns the “quark” spread if it is operating. Credit Suisse noted that 2011 and 2012 were years of heavy outage. The largest part of the increase in outages was driven by large reactors down with operational problems (Crystal River, San Onofre, and Fort Calhoun), although extended outages for uprates also played a part (Turkey Point, St. Lucie). The reactors with the longest outages, facing substantial repair costs, Crystal River and San Onofre, have since been retired. The load factor – the percentage of the year a reactor is online producing power – is an important determinant of its economic performance. The average load factor is not only 4% lower for the oldest reactors, but the standard deviation is almost twice as high. In a market where margins are so thin, a 4 percentage point difference in load factor is an important loss of revenue, and the much higher standard deviation represents significant uncertainty. Age and reliability matter and they go hand in hand. The analysis of the economics of aging reactors identifies a number of other characteristics that appear to reduce the economic viability of aging reactors. Small units that stand alone – geographically or organizationally – are believed to have higher costs and therefore are more vulnerable in the current market environment. Both of these factors generally reflect economies of scale since operating costs are spread across a smaller amount of capacity and output. Large, multi-unit sites integrated into corporate fleets of reactors can share indivisible costs. The retirement of Kewaunee underscores the fact that the economic benefits of being part of a fleet of reactors are dependent on the geographic location of the reactors as well. Credit Suisse presents a similar analysis for regulated reactors, noting that “deregulated market prices are somewhat less relevant but we think… illustrate the challenges to economics of regulated nuclear as well.” Market economics may not rule in these cases, but these reactors exhibit similar difficulties. Using Kewaunee economics as the dividing line (cash flow of about $9/MWH); there are almost two dozen regulated reactors with challenging economics. In this groups are retirements (San Onofre), canceled uprates (Prairie Island), and a long term outage (Fort Calhoun). We find seven standalone assets, eight reactors with less than 20 years remaining on their licenses, and half a dozen small reactors (700 MW or less). There are 14 reactors that have two or more of these characteristics. Thus, in terms of basic economics, there are three dozen reactors that are on the razor’s edge. The above analysis describes the “normal” process of operating an aging fleet in the context of an energy economy in which low cost resources are available to meet needs. With the economic viability of an increasing number of reactors coming into question, the possibility of the need for significant capital expenditures becomes quite ominous. The prudence of making major expenditures to meet safety concerns, repair breakage and install technologies to increase output (uprates) is called into question. While there is a tendency to treat these as extraordinary events, they are frequent enough to merit consideration as part and parcel of the nuclear economic equation. The commercial nuclear industry has historically had difficulty executing major construction projects and that problem afflicts aging reactors. The retirement of Crystal River and San Onofre was precipitated by repairs/upgrades that failed badly, resulting in the need for major repairs. The Florida uprates had substantial cost overruns. The Monticello life extension and uprate activity have experienced cost overruns of over 80 percent. The response of Executives responsible for the Monticello uprate is revealing. “It is a large complex project with many intricate components that required changes from the original plans,” Xcel’s chief nuclear officer, Timothy O’Connor, said in recent written testimony submitted to state regulators…O’Connor… testifies that other reactor projects – Grand Gulf in Mississippi, Turkey Point and St. Lucie in Florida and Watts Barr in Tennessee – also experienced cost overruns, in one case double the original estimate. Defending uprate cost overruns by pointing out that everyone else is suffering the same problem is more an indictment of the industry than a defense of the utility. In fact, the severe contemporary execution risk of keeping old reactors online or increasing the output has started to look a lot like the contemporary (and historical) execution risk of building new reactors. With almost three dozen uprates approved since 2009, over half have been abandoned cancelled or put on hold. Half of those that have moved forward have suffered major cost overruns. The major uprates that have been proposed, and in a number of cases cancelled or abandoned, generally have cost estimates in the range of $1800 to $3500 per kW. Actual costs have been much higher, in the range of $3400 to $5800/kW. These high actual costs of the uprates are three to four times as much as new advanced combined cycle gas plant costs. Even the initial cost estimates were almost twice as high. Since the reactors being proposed for uprates are still old reactors, they are likely to have significant operating costs, although the uprates may improve their performance. With new gas plants being more efficient, as well, and having much lower capital costs and short lead times, it may well be that choosing between an uprate and a new gas plant has become a very close call. This explains the mixed record of major uprates in the past half-decade. Since uprates represent the largest capital projects most reactors will witness and most nuclear utilities will undertake in the mid-term, the poor performance is telling. These uprates are afflicted by the same flaws as new builds, past and present, cost overruns, delays, declining demand and low cost alternatives. One factor to which UBS devotes a great deal of attention, but Credit Suisse does not mention, is safety related costs. Safety concerns surrounding spent fuel are presently holding up the license extension for a dozen reactors as the NRC deals with a court challenge to its “waste confidence” finding. Fukushima and the “waste confidence” ruling remind investors that nuclear power has a unique set of risks that may weigh on economic decisions. In a major post-Fukushima analysis of the nuclear sector UBS called it a “tail risk.” This is an event that may have a very low probability, but which can have a huge impact on the value of an investment. It has come to be identified more popularly as a “black swan. In my earlier analysis of the impact of Fukushima, I cited an estimate of the potential costs that ran to a quarter of a trillion dollars. Tokyo Electric Power Company is seeking public funds to help it pay for its current estimate of costs, which is $137 billion. The number has been rising steadily and there is some question about whether the victims are being fully compensated. The estimate of $137 billion, if that is the final cost, underscores several important points about nuclear safety and nuclear costs. First, the disaster bankrupted the company. Its stock collapsed and it has been taken over by the government. If only $137 billion can bankrupt the 4th largest utility in the world, the “tail risk” associated with nuclear reactor ownership should get the attention of investors. Second, the economic impact of nuclear accidents does not flow from the public health effects, but from the disruption of the affected community. The most immediate impact of nuclear accidents may not be the deaths that they cause, but the disruption of the economy and social life of a large surrounding area and psychological despair that they cause. I have shown that Fukushima deserves the attention it gets in both the historical and contemporary contexts, but there is a larger lesson here. Safety is an evolving concept in nuclear power because the power source is so volatile and dangerous and the technology to control it becomes extremely complex. Over time, external challenges and internal weakness are revealed. The threats to public health and safety cannot be ignored. Responding to them becomes particularly costly for existing reactors, since retrofits are difficult. As older reactors become farther and farther out of sync with the evolving understanding of safety, the challenge grows. Turning to the future, there are a significant number of reactors, a third of the fleet that exhibits the characteristics that put reactors at risk for negative developments. Exhibit III-6 summarizes the risk factors faced by over three dozen aging reactors. The first six factors – cost, small size, old, standalone, selling into a wholesale market and short cost recovery periods – reflect the economic dimension. The next 5 risk actors involve Operational factors (broken, reliability and long term outage) and safety factors (Multiple safety issues and Fukushima retrofits). These reflect the operational/repair dimension of the analysis. The first 3 reactors evaluated have been retired early and they highlight the two different types of factors that create risk. Kewaunee epitomizes the purely economic factors. Crystal River and San Onofre epitomize the repair/outage factors. I have only included reactors that exhibit at least three of the risk factors as identified in the sources cited. The list is long and not intended as a prediction of which reactors are “the next to go.” The historical analysis shows that it is generally a combination of factors that leads to the retirement decision. However, the vulnerability of large numbers of reactors suggests that there will be future early retirements and uprates will be slow to come. The analysis is primarily economic, as indicated on the left side of the table. All of the reactors have significant economic issues. If anything goes wrong, any of these could be retired early. The precipitating event could be a further deterioration of the economics, or it could be mechanical or safety related problems, as indicated on the right side of the table. The market will operate faster in the case of merchant reactors, but economic pressures have become so severe that regulators have been forced to take action as well. The same factors call into question the economic value of license extensions and reactor uprates where they require significant capital outlays. The dire straits in which a significant part of the U.S. commercial nuclear fleet finds itself are not an aberration or a sudden shift in prospects. It is part and parcel of the history of the industry in the U.S. In fact, the quiet period of high performance in the late 1990s and early 2000s is the exception rather than the rule. With the memory of the huge cost overruns in the 1970s and 1980s fading, the quiet period of the 1990s played an important part in creating the misimpression that new reactors would just hum along. This contributed to the misleading economic analysis on which the “nuclear renaissance” relied during its early hype cycle. The assumption that nuclear reactors hum along, once they are proposed or even online, is not consistent with the U.S. experience. About half of all reactors ordered or docketed at the Nuclear Regulatory Commission were cancelled or abandoned. Of those that were completed and brought online, 15% were retired early, 23% had extended outages of 1 to 3 years, and 6% had outages of more than 3 years. In other words, more than one-third of the reactors that were brought online did not just hum along. Another 11% were turnkey projects, which had large cost overruns and whose economics were unknown. The magnitude of long outages and early retirements is sufficient to require that they be incorporated into the economic analysis of nuclear power. The pattern across time reinforces the observation that the high level of performance in the late 1990s/early 2000s were an exception rather than the rule. After a large number of reactors came on line there were a significant number of outages in the early 1980s. Again in the 1990s there were a significant number of outages and retirements. The lull of problems in the late 1990s and early 2000s has been followed by a sharp increase in problems. The average cost of an outage (in 2005 dollars), even before the most recent outages, was more than $1.5 billion, with the highest cost topping $11 billion. The costs of the recent outages that led to early retirement in Crystal River and San Onofre run into the billions. The occurrence of outages has a strong correlation with retirement, as does the occurrence of a second outage. Early retirement reactors are typically older and smaller. The early retired reactors were brought online before the agency (originally the Atomic Energy Commission) began to adopt and enforce vigorous safety regulation. They are not worth repairing or keeping online when new safety requirements are imposed, or when the reactors are in need of significant repair. Outages exhibit similar relationships. The larger the number of rules in place when construction was initiated, the less likely there was to be an outage or an early retirements. The larger the increase in rules during construction, the greater the likelihood of an outage. While the industry interprets the existence and change of rules as an expensive nuisance, I have shown that they reflect strong concerns about safety that were triggered by the extremely poor safety record of the industry in its early years. The older reactors experienced more outages and needed more retrofits to get back or stay online. They were built before performance was regulated, generally performed poorly and suffered the outage and retirement consequences. Qualitatively, the decision to retire a reactor early usually involves a combination of factors such as major equipment failure, system deterioration, repeated accidents, and increased safety requirements. Economics is the most frequent proximate cause, and safety is the most frequent factor that triggers the economic reevaluation. Although popular opposition “caused” a couple of early retirements (a referendum in the case of Rancho Seco; state and local government in the case of Shoreham), this was far from the primary factor, and in some cases local opposition clearly failed (referenda failed to close Trojan or Maine Yankee). External economic factors, such as declining demand or more-cost-competitive resources, can render existing reactors uneconomic on a “stand-alone basis or (more often) in conjunction with one of the other factors. The increasing problems faced by aging nuclear reactors are reflected in the load factor. The average load factor for the nuclear industry throughout its history of commercial operation in the United States has been less than 75%. While it is true that over the decade from the late 1990s through the end of the 2000s the load factor was 90%, it is also true that it took 20 years to get to that level and the industry has recently fallen below it. This is the source of concern expressed by the Wall Street analysts about the aging fleet, but it also raises an important point about new reactors. New technologies require shake out periods and the more complex they are, the longer the period. The assumption of a 90% load factor for new builds is highly suspect. Moreover, the calculation of load factors overestimates the actual load factor because the denominator includes only reactors that are operable. Reactors that have been retired early or are on long term outage (not in service for the entire year) are not included in the analysis. I show an adjusted load factor that includes in the denominator the long term outages and early retirements. I assume that all the early retirements were reactors that were expected to still be on line, but for the difficulties that shut them down.This number is substantial. When early retirements and long term outages of more than a year are taken into account, the load factor has been about 70%. Operating costs appear to exhibit a similar long term pattern as load factors. There was a long period of rising operating costs, then a period of modest decline and relative stability. However, in the past decade costs have begun to rise again. What we can say about the recent past is that in a short period of time the industry has experienced a full complement of the bad things that can happen to old reactors – purely economic retirement, broken reactors, an uprate that developed into a broken plant and an early retirement, large cost overruns for new builds and uprates and abandonment of uprates. We can also identify the circumstances that brought these negative events about and show that they are not only short term aberrations, but are consistent with the long-term history of the industry. The key question is: will the price of alternatives keep the economic pressure on the margins of aging reactors with rising costs? Predicting long-term natural gas prices has been described as a perilous undertaking, but a consensus has emerged among most reasonable analysts that a significant period of low gas prices is upon us. Projecting price out 50 years may be very risky, but 20 years is less so and that is the relevant time frame for aging reactors. Exelon’s battle with wind, its efforts to move the market clearing prices and its decision to cancel the uprates at Limerick and LaSalle and its earlier decision to abandon its plans to build a new reactor, reflect the very challenging economics that nuclear faces in today’s market. Those economics are driven by a belief that gas prices are likely to remain low for the relevant economic time frame. John Rowe, CEO of Exelon has been adamant in this regard. Traders on the NYMEX agree with Rowe, who notes that analysts do not see a high gas price over the several decades. As we have seen, wind power plays a role by shifting the supply-curve in such a way that it lowers the market clearing price. As wind is added to meet long-term needs, it has this short-term effect. Rowe also notes that there are renewables that will compete with nuclear in the next decade – “But, as I look, I think wind and solar do become more economic, wind much the first. Nuclear plants may become economic again but not in the next decade.” Longer-term cost trends support Rowe’s observation that alternatives to nuclear power beyond gas are becoming more attractive options. In contrast to nuclear reactor construction costs and cost estimates that have been rising dramatically, several of the alternatives are exhibiting reductions in cost, driven by technological innovation, learning by doing, and economies of scale. There is certain to be a great debate about how much the reduction in electricity consumption reflects the recession, there is no doubt that increasing efficiency will change the trajectory of demand. With new building codes and appliance efficiency standards, per capita energy consumption will decline significantly over the next two decades. New building codes call for a 30% reduction in energy consumption in new building designs. Since the oldest, least efficient buildings are likely to be replaced, the effect will be larger than that. The stock changes slowly however. Appliance efficiency standards have been raised in recent years and the Obama administration has announced a program to raise standards on many appliances in the range of 20 to 30%. Since the life cycle of appliances is much shorter than buildings, over the course of two decade most appliances will be replaced by more efficient models. The decline will offset increases in population and GDP, resulting in, at best, flat aggregate demand. The debate over climate change has also placed great emphasis on improving efficiency and using renewables. With aggregate demand likely to be flat, at best, and renewable costs falling and output rising, the downward pressure on market clearing prices is likely to continue. It appears likely that the pressures on the market clearing price will continue for the period in which decisions about retiring aging nuclear reactors will be made. Nuclear economics have always been marginal at best. The first cohort of commercial reactors was much more costly than the available alternatives, but those reactors were forced online by a regulatory system that did not have a market to look to, or care to do so even if one existed. It can be argued that the locomotive that pulled half the nation toward restructuring and much greater reliance on market signals was the reaction against the excessive costs of nuclear power. Some advocates of restructuring loudly declared restructuring would prevent another nuclear fiasco. Ironically, it appears that an unintended consequence of the shift toward markets will be to force the early retirement of the very reactors that a market never would have allowed to be built in the first place. While half the country does not rely on markets to set the price of electricity, the presence of markets across the country sends strong signals to regulators that keeping aging reactors online, especially if they need repairs or retrofits, does not make economic sense. Thus, although the outcome is ironic in the long sweep of nuclear history in the U.S. it is perfectly consistent with the fundamental economics of nuclear power throughout that history. While the purpose of the Wall Street analysis is to advise and caution investors about utilities that own the aging fleet of at-risk reactors, my purpose is to inform policymakers about and prepare them for the likelihood of early retirements. By explaining the economic causes of early retirements, the policymakers will be better equipped to make economically rational responses to those retirements (or the threat of retirement). Economic reality has slammed the door on nuclear power. In the near-term old reactors are uneconomic because lower cost alternatives have squeezed their cash margins to the point where they no longer cover the cost of nuclear operation. In the mid-term, things get worse because the older reactors get, the less viable they become. In the long term new reactors are uneconomic because there are numerous low-carbon alternatives that are less costly and less risk. About Mark Cooper: I am a Senior Fellow for Economic Analysis at the Institute for Energy and the Environment at Vermont Law School. A copy of my curriculum vitae is attached. I am an expert in the field of economic and policy analysis with a focus on energy, technology, and communications issues. For over thirty years I have analyzed the economics of energy production and consumption on behalf of consumer organizations and public interests groups, focusing in the past four years on cost of the alternative resources available to meet electricity needs for the next several decades. My analyses are presented in a series of articles (1), reports (2), and testimonies before state regulatory agencies and state and federal legislatures. I have served as an expert witness in several regulatory proceedings involving electricity and nuclear reactors, starting with proceedings before the Mississippi Public Service Commission almost 30 years ago regarding the proposed Grand Gulf II nuclear reactor and including proceedings before the Florida and South Carolina Commissions regarding the proposed reactors in those states. (1) Cooper, Mark. “The Only Thing that is Unavoidable About Nuclear Power is its High Cost,” Corporate Knights, forthcoming; “Nuclear Safety and Afford able Reactors: Can We Have Both?,” Bulletin of the Atomic Scientists, 2012; “Nuclear Safety and Nuclear Economics, Fukushima Reignites the Never-Ending Debate: Is Nuclear Power Not Worth the Risk at Any Price?,” Symposium on the Future of Nuclear Power, University of Pittsburgh, March 27-2 8, 2012; “Post-Fukushima Case for Ending Price Anderson,” Bulletin of the Atomic Scientists, October 2011; “The Implications of Fukushima: The US Perspective, Bulletin of the Atomic Scientists, July/August 2011 67: 8-13. (2) Public Risk, Private Profit, Rate payer Cost, Utility Imprudence: Advanced Cost Recovery for Reactor Construction Creates Another Nuclear Fiasco, Not a Renaissance, March 2013; Fundamental Flaws In SCE&G’s Comparative Economic Analysis, October 1, 2012; Policy Challenges of Nuclear Reactor Construction: Cost Escalation and Crowding Out Alternatives, September, 2010; All Risk, No Reward, December 2009; The Economics of Nuclear Reactors: Renaissance of Relapse, June 2009; Climate Change and the Electricity Consumer: Background Analysis to Support a Policy Dialogue, June 2008. Kaufman, A. C. 2018. Trump Administration’s Climate Report Raises New Questions About Nuclear Energy’s Future. The thirstiest source of electricity is already struggling, and greater risk of droughts will only add to those woes. Huffington Post. Platts. March 29, 2016. Nuclear safety upgrades post-Fukushima cost $47 billion. Plumer, B. July 21, 2017. U.S. Nuclear Comeback Stalls as Two Reactors Are Abandoned. New York Times. This entry was posted in Nuclear Power and tagged age, cost, decommission, nuclear power, operating cost, quark, repair, risk, safety, shutdown. Bookmark the permalink. I don’t think Mr./Dr. Cooper looks that closely at NG. But he is an expert. What would he say about 123% increase in NG rigs year over year but level production at best?